With the pressure to succeed, build up your transcript, and sky-rocket your GPA rising, we wonder if the pressures of a prestigious school such as North Allegheny is actually damaging students' mental health. Continuing the Conversation: Does NA Culture Push Kids Too Far? NASD has implemented many measures to reduce student stress, but it still seems to exist. We ask why. North Allegheny is known for giving its students stellar opportunities. We seem to have the best to offer in sports, arts, and especially academics. With so many honors and AP classes to choose from, students are often encouraged to challenge themselves. However, where do we draw the line? Where does a healthy challenge end and a stressful obsession to get a higher GPA begin? Does the competition and pressure at such an acclaimed school like North Allegheny push students too far? These are the big questions we asked alumni and teachers, and the feedback revealed a lot about the culture at NA. Most alumni agree that during their high school years, they were often pressured too much and that this constantly caused problems. “The pressure to over-excel and succeed was overwhelming…Students were constantly battling the never-ending idea that what we were doing was never enough,” said Emma Barnes, a previous student. This battle that Barnes describes can lead many students to load up their academic transcripts with classes that may not be beneficial for them. At NAI this past year, 338 waivers were submitted in order to waive into Honors English, World Language, Math, Science, and Social Studies classes. It also includes sophomores who waived into AP Human Geography. While waivers can occasionally be helpful, they can also cause some issues in classes. They put students of different levels together in a fast-paced course. In most cases, there is a decrease in waivers from 9th to 10th grade. This is usually because students begin to find what level is right for them and choose to stick to that. 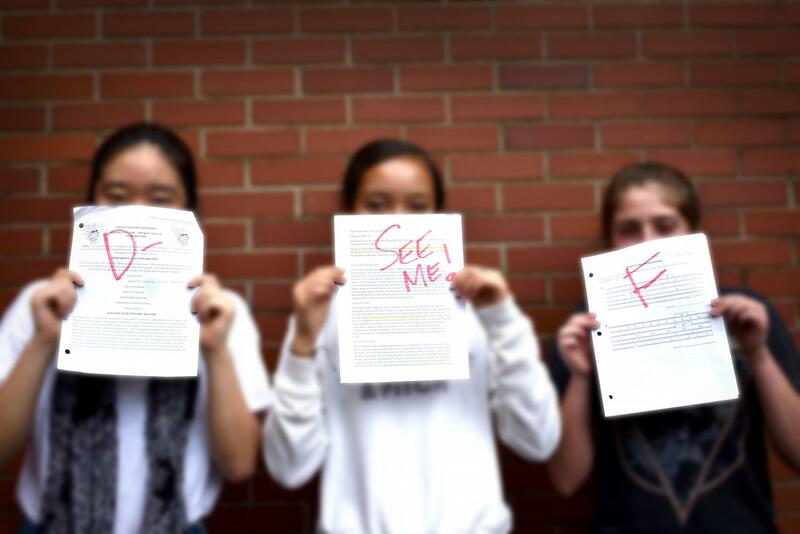 As an incoming freshman, it can be hard to gauge exactly what an honors class entails. Many students waive into classes they were not recommended for and do so to challenge themselves. But the reason they feel the need to push themselves may come from the fear that their current track isn’t good enough. The pressure doesn’t just come from administration and parents. In fact, many students agree that most of the stress comes from their fellow peers. In such a large school, where everyone seems so talented, just keeping up can be a daunting task. So, kids join a dozen clubs, strain themselves in sports, and typically take the maximum number of honors and AP classes. But, usually, they don’t do it for themselves. They do it so they don’t get left behind. But getting left behind can be exactly what happens when students waive into too many higher-level classes and overwork themselves with hours of studying and homework. There’s always a breaking point, and when this point is reached, those grades that they were trying so hard to get and their mental health both suffer. Plus, for many kids, it can be hard to draw the line between challenging themselves and taking it too far. Our school encourages students to strive for greatness but not to be stressed. We’re supposed to work hard but not so hard that we feel the damaging mental health side effects of doing so. It’s a game of trying to find the perfect balance, and if you misjudge, you end up dealing with the consequences. This pressure from peers can also lead to intense competition, which, in this amount, can be harmful to students. “Amongst the competitive nature at NA, the pressure to be the best at everything is rising… I don’t think going through all it takes to get to a top college is worth the lasting effects of damaged mental health that students may have to deal with for the rest of their lives,” said alumna Angela Lu. Competition, like anything, can be great in small doses. It can challenge and motivate kids while creating opportunities for them to grow. Those are really positive things. However, the truth is that so much competition quickly turns toxic and ends up leaving talented students feeling drained and exhausted. It turns the curiosity and wonder that used to be associated with education into a mentally painful contest that no one wants to experience. Competition like this can make even some of the brightest, most enthusiastic kids hate learning. Teachers also have some thoughts when it comes to the increasing pressures in our school. Stress has been a big topic of conversation in our school district as of late. While later school start times and mindfulness have been proposed solutions, they won’t do much good if the pressure to take too many challenging courses remains. According to Mr. Lamm, who teaches Honors American History, the key is finding the perfect middle ground. “I think we as teachers need to help students understand that their health, well-being, and happiness will always be more important than an academic transcript. Kids should find what is an appropriate challenge that affords them challenges for growth and success while also allowing themselves to explore and enjoy that which makes them happy. As with anything in life, find the balance and the ‘sweet spot’ where you’ll be happiest, most productive, and most successful,” he said. Mr. Lamm also recommended looking up the Law of Diminishing Marginal Returns, as it may be helpful for scheduling. It is also important for a student to weigh how much they can handle versus the long-term benefit of more difficult courses. “If it causes too much stress, then the end result is not worth the hassle. It’s an individual decision,” said Economics and AP Human Geography teacher, Mr. Hildenbrand. So, while students may be feeling the heat, teachers are also well aware of this issue and its impact on the school climate. Yet, despite the fact that the stress and pressure made high school a lot harder, some alumni believe it better prepared them for their future. “The stress was well worth the preparation,” Thomas Wheeler, another graduate of NA, commented. To many, if chasing after that crazy academic transcript now means that they can get into a great school and be well prepared for the college life, it’s worth it. At the end of the day, it comes down to a personal choice that varies from student to student. One of the best things about North Allegheny is that everyone can choose their own path. Still, while it is up each person to decide what’s right for him or her and how much they want to challenge themselves, it’s important to realize that the motives for doing so may be influenced by the school’s environment and the need to feel up to par. However, it is even more important to realize that with or without that skyrocketed GPA and a schedule full of AP classes, you are good enough. You will still get into a good college, and you will still be able to reach all those exciting goals that are in your future. It can be hard to think like that, especially after years of being trained to think that we need to work hard and push ourselves past the breaking point to succeed. But it’s worth a try, because it’s the only kind of thought process that will revolutionize the competitive culture in our schools and make every student’s high school years a healthy, fun time of growth– the way it’s supposed to be. Kristen you have REALLY touched a nerve. Last week a special section of the CBS evening news discussed exactly this kind of pressure affecting the rates of teen suicide and drug abuse. and social behavior We as teachers ARE aware of it, we DO care and we WANT to help, but as you say, each case is different – a well written look into one of the most pressing concerns in education.